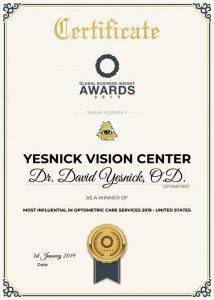 At Dr Yesnick’s low vision center in Las Vegas, our patients are our biggest source of pride. Every day we help people who were told that there is nothing more that can be done, to achieve more and use their maximum available vision. Our patients come in from all over Nevada and from out of state and even out of the country, because they know that they will receive unparalleled care with Dr. Yesnick, Sandy, and our caring low vision team. Many of our patients are wowed by our fully integrated approach to low vision care. We not only offer comprehensive exams using the most advanced equipment for patients with Diabetes, Cataracts, Macular Degeneration, Retinitis Pigmentosa, Stargardt Disease, and Stroke related vision problems. We also offer a full list of services such as a dedicated driving school for low vision, a low vision non-profit, classes such as how to cook with low vision, and a huge selection of the latest low vision aides, lamps, magnifiers and telescope glasses. Aside from the small selection of reviews on this page we also have over 300 reviews on Google and Yelp combined. You don’t often hear of trips to the eye clinic being a highlight of anyone’s day. I had a great appointment yesterday with Dr. Y and his crew. On my fourth year with these guys, I still feel thrilled I found them. I wasn’t rushed, everyone was professional, warm and helpful. Dr. Y is one of the best doctors I’ve ever known and I’m 65. I’m not going anywhere. Everyone was so nice and pleasant. Dr. Yesnick was so friendly and he explained everything. I felt very comfortable through my entire exam. I didn’t get my glasses technician’s name, but she was so sweet and helpful. I will definitely recommend YESnick vision center!! First let me start out by saying that I am new to the City of Las Vegas, and I’ve had to rely a lot on review outlets to find quality service. 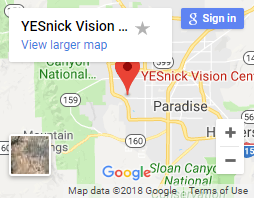 Yesnick Vision Center was no exception. From the very moment, a walked in the door to the time that I left the service was EXCEPTIONAL!!!! Thanks, Dr. Yesnick and staff ( Amanda, Josie, and Monique). Dr. Hitzeman and Dr. Yesnick were very thorough with my eye exam. I really appreciate the time they took to explain the process. Definitely, recommend. Dr. Yesnick is one of the best doctors I have been to. He explains everything in detail and takes his time with you. I usually dread going to doctors but I do not feel that way when I go 2 Dr. Yesnick. he has a very nice personality. His office staff is very nice as well. Josie helped me extensively pick out glasses and the price was very good on them. She is very nice and takes her time with you as well. I really appreciated her understanding as I took a long time to pick out glasses. Amanda helped me through the eye exams and another excellent staff member. I like the fact that Dr. Yesnick will go the extra mile if you have a medical problem with the eye test. He wants to make sure that when you get older you can avoid falls Etc and get the correct glasses for you. He is a distance from me and I don’t like to drive but it is well worth it.